Applications are now open for artists interested in the year-long Fellowship position, which will be located within the St. Paul Office of MnDOT. See the full call for artists and application. Recognized as a tool for pioneering innovative and creative solutions, artist-in-residence programs have been piloted across the nation in municipal governmental agencies, including the cities of Los Angeles and Seattle, but never before at a statewide agency. In Fergus Falls, MN, artists-in-residence have increased cultural programming to support community development. In Lanesboro, MN, the artists-in-residence have used art as a catalyst for deeper community engagement. In Minneapolis, artists-in-residence have used theatre to help the city’s Regulatory Services Department develop more empathetic policies and better relate to their constituents, while St Paul’s artists-in-residence have worked to make community meetings more creative, fun, and productive. Several organizations collaborated on the Community Vitality Fellowship position, including Smart Growth America, ArtPlace America, and MnDOT. Transportation for America (T4America) will administer both the funds and the overall program, including providing staff and consulting assistance. The State Smart Transportation Initiative (SSTI) will also provide staff support. Both T4America and SSTI are programs of Smart Growth America. MnDOT will supply in-kind contributions consisting of work space for the selected Fellow and staff time for agency workers to collaborate on the groundbreaking new program. “Artists can provide fresh approaches and new ways of doing things, interpret complex processes, and provide unique perspectives for existing programs,” said Ben Stone, Smart Growth America’s director of arts & culture. “While a handful of cities have embedded artists in various departments over the years, MnDOT will be the second statewide agency to embark on such a program. 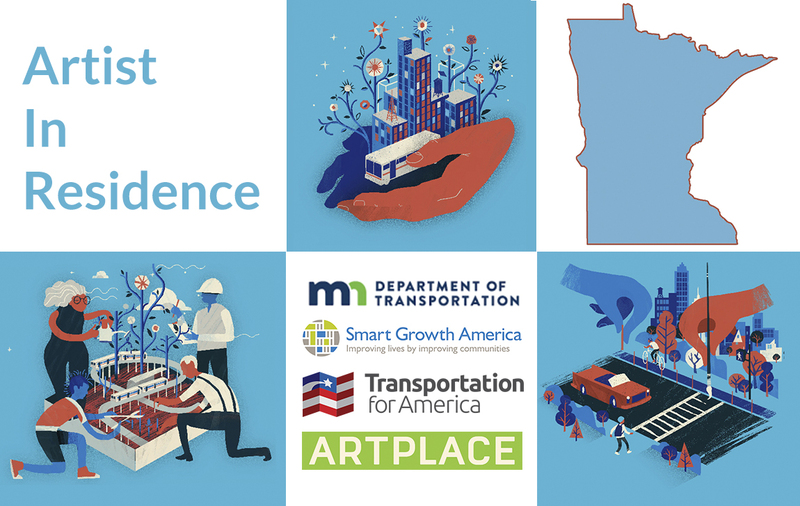 We’re excited to be a part of helping Minnesota harness arts and creativity to create better supported and more beloved transportation projects that help accomplish the state’s goals.” Minnesota will join Washington State DOT in our artist-in-residence program by hosting a Community Vitality Fellow. The Fellowship will run for one year with rotations through MnDOT’s core divisions to gain knowledge on the agency’s operations, priorities, and challenges. The Fellow will then propose process improvements to address MnDOT’s overarching goals while improving community engagement, supporting safe places to walk and bike, and enhancing equity in the planning, building, operations, and maintenance of transportation infrastructure. The Fellow will develop processes and procedures to further evaluate and integrate elements that elevate the unique character of each community within the transportation system. CONTACT: Ben Stone, [email protected] / 410.370.3843 and Jessica Oh, [email protected] /651-366-4939. Transportation for America is an alliance of elected, business, and civic leaders from communities across the country, united to ensure that states and the federal government step up to invest in smart, homegrown, locally-driven transportation solutions—because these are the investments that hold the key to our future economic prosperity. T4America is a program of Smart Growth America. Minnesota Department of Transportation oversees transportation by all modes, including land, water, air, rail, transit, walking, and bicycling. The agency is responsible for maintaining, building, and operating the state highway system to ensure a safe, accessible, efficient, and reliable transportation system that connects people to destinations and markets throughout the state, regionally, and around the world.